Running A Meal Delivery Business? Let Our Software Help! When it comes to meal delivery services, a couple big names come to mind. HelloFresh, Blue Apron, or Home Chef offer people what they want in this day and age: the perfect combination of convenience and fresh food. While it may seem like the “big guys” are already established, this industry is only beginning to take off, meaning that it is more important than ever to make sure that your local meal delivery service doesn’t fall behind the global and national ones. In order to keep your foot in the game, you need to make sure your service can compete with these other companies. People know that if they choose your service over a national one that they will be getting the freshest food, likely for a lower price, and that they are also supporting their local economy. However, one thing they might be wary of is whether or not this local business owner has the ability to get their orders to their door on time every week. When it comes to delivering, we naturally trust big businesses whose names we recognize. Amazon can get you an item you ordered in less than 48 hours, yet if you order something from a random artist selling their work on Etsy, you might have to wait a couple of weeks. Even if you have the most punctual and accurate method of delivering meal kits to front doors everywhere, many people are still going to think, “Well, I saw a commercial for HelloFresh, so I bet they are really good at what they do.” And don’t get us wrong, these meal kit services are successful for a reason, but that doesn’t mean you can’t keep up with them and offer an equally good or better service. 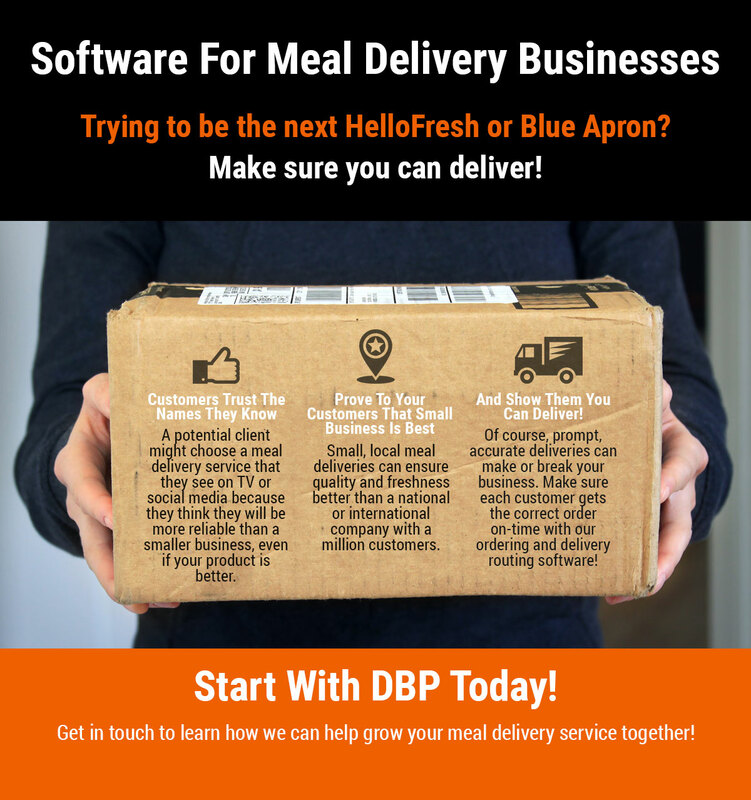 Delivery Biz Pro (DBP) is a full-service delivery software committed to helping your business succeed. We specialize in local businesses who provide a recurring delivery service to their region, whether they are delivering milk, water, propane, or in your case, meal kits. When you use Delivery Biz Pro, our team of designers and developers will create a beautiful website where your customers can browse your product, add items to their cart, and place orders for delivery. Our goal is to showcase what your business can offer so more people stay on your website for longer. These sites are mobile-compatible, so whether someone is browsing on a desktop or an iPhone, they’ll see the best version of your website every time. You have complete control and customization over the features of your website, but there are a few standard procedures that more business owners like to include. One such feature is an automatic confirmation email that gives customers peace of mind knowing that their order went through. You can also set it up to send reminder emails a day or two before the delivery is to be made, email promotional discounts to your customers, send out a “Thank You” email the first time a customer signs up, and so forth. All of these abilities help give your business credibility and ensures customers feel like they are getting a legitimate service. With your suite of admin tools, you can also sell seasonal products for a certain date range, allow customers to create recurring orders, change delivery fees based on the customer’s location, promote featured products, and set up your website to automatically update when a specific product is out of stock. With these orders in place, you can print out or use a tablet to view a detailed order log so you know what needs to go in which meal kit box. When it’s time to load the trucks, the software can automatically generate delivery routes for drivers, as well as load sheets to help you load your trucks in a first-in-last-out fashion, or whatever load order works for you. With the routing software, you can generate multiple routes based on neighborhood or day of delivery, assign customers to multiple routes, and have complete control over whether your drivers are delivering based on mileage or travel time between houses. Your drivers can also make changes on the road if necessary, reroute themselves around construction, send follow-up emails to customers after drop-off, and more. These features are only the tip of the iceberg, and our professionals can help you along the way to find the perfect combination of tools and features to keep your business running smoothly. Perhaps the best part about using our ordering and delivery software is that you only have to work with one company. Rather than have one company build your website and another manage your orders and a third handle driver routing, you can trust that our software will work seamlessly because we’ve designed it that way. If you are interested in seeing more about what Delivery Biz Pro can do for you, then apply to use our delivery software and we’ll set up a time to chat. We want to make sure that we are the best choice for your business, which is why we like to do things a little old school and have a real conversation before you commit to buying our product. After all, our success depends on your success, and you can bet you’ve got a team of people here at DBP rooting for your success. Get in touch today!